We’re proud to announce the next major update of NFC interactor: the user experience release! After adding countless new features with the 6 updates that we released during the past 9 months (of course all free for our paid users), it was time to concentrate on the usability and reach of the app. Some statistics about the enormous scope of NFC interactor: the app supports 20 different tag type categories, with 150 distinct details that you can add / edit for the various records. You can launch 58 system apps and settings pages, e.g., to activate flight mode or network settings. You will frequently have to re-use some of your tag type compositions. 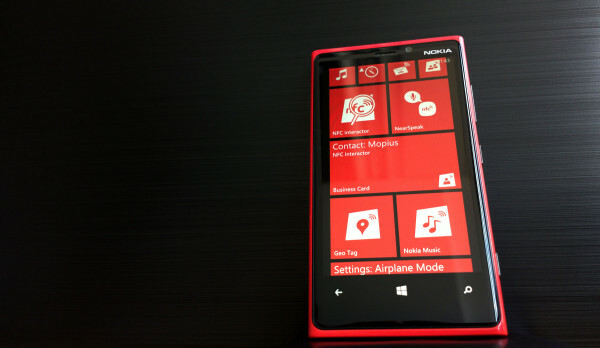 NFC interactor 5 now enables you to pin those compositions to a live tile -> instantly share them with one tap! An example: In the composer, import your contact details from your address book. 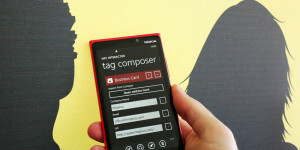 Edit the details you want to share to others in NFC interactor’s tag composer. Now, tap the new “pin to live tile” button to customize the live tile. The title will be an automatically generated summary of the tag contents, but you can customize it to best suit your needs. 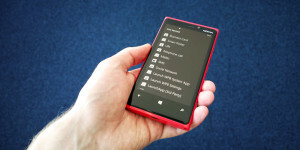 Additionally, you can choose if tapping the live tile should trigger writing the message to a tag, or sending it to a peer device. If you choose the latter, just tap the live tile, and within a second, NFC interactor will have started, loaded your stored composition and starts to share the contact details! With a single tap, you can now share your contact details with friends and colleagues. NFC interactor 5 features a dedicated publish page, which makes the tag writing process a lot more visual and clear. The status image will always show the current phase of the writing process, clearly inform about the success or any failure that occured. Most use cases only need a single record in the message. The new editor now defaults to this mode, and conveniently lets you reset the message from the app bar as well. Additionally, the optional record ID is now hidden by default, as it is only useful for developers. 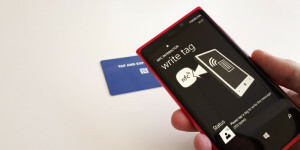 Of course, NFC interactor still allows to write multi-record messages, as well as adding the record ID. Just activate the respective options in the app settings. NFC interactor 2 added the feature to view, export and import the raw hex string of an NDEF message. Now, this incredibly powerful feature just got even more useful: you will see the tag contents converted to charcters where possible, comparable to the view you know from hex editors. This helps tremendously when analyzing messages; of course, the new data view is also included when you share the message contents via email from the context menu of a message. The most visible change in the new release is that every record type now got its own icon to improve accessibility; it’s used in the add record page, the tag composer, the publish page as well as on the live tiles. Subtle page transitions make the app smoother to use. “Social Network” type: NFC interactor now supports the Foursquare app launch instead of redirecting to the website, as the updated official Foursquare now implemented the app2app protocol which allows launching the app. Note that this protocol doesn’t seem to be supported by the Foursquare for Android version at the moment. Additionally, you can link to Google+. Other changes include fixes for fast app resuming, restoring the message in the composer, a version history page, app statistics in the about page and a clear log button in the info view. 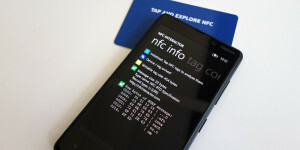 The improvements of the last two NFC interactor releases went along with significant extensions to the application core. To provide the best possible quality, we decided to do a public beta test and invited users via Twitter to join – it has been a phenomenal success! With the help of additional beta testers and quick and agile software development with almost daily releases, we were able to further improve usability and fix the issues we found together during the tests. Thanks again for all your help to our beta testers!